to the common date. For example, the present year 2013 would be 6013 A.L. dated from when God said, "Let there be light." (and probably still is in some editions). Archbishop Ussher gave the date of the Nativity of Jesus as "Anno Mundi"
the Old Testament, and trying to correlate them with known historical dates. Obviously, there are many possible sources for error in such a method. 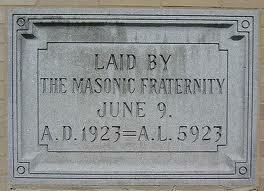 usually been either to the Year of Masonry or by the abbreviation 'A.L.' . .
of documents throughout the 18th century and well on into the 19th. . . .
genitive plural case of the Latin word "Latomus," meaning "of the stonecutters." answered all questions by shouting loudly, 'I don't know! I don't know!'" them in all their paths, looking to the perfect day." Happy New Year, and a year of Masonic Light to all of us!!! !